George Parks was a happy guy – but then, happiness was kind of in his DNA. 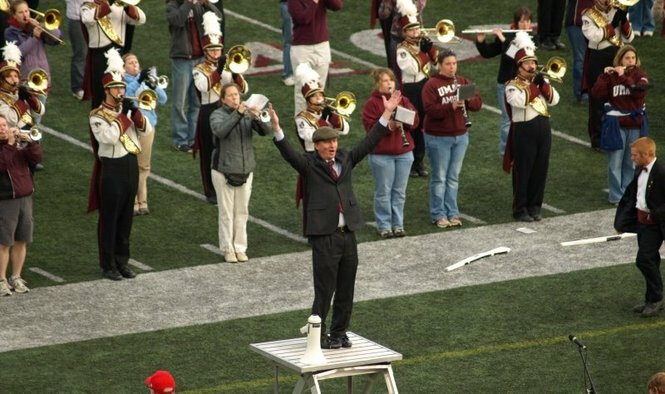 He was the leader of the band, a tuba player, a drum major, and for 33 years, the Director of the Marching Band of University of Massachusetts. 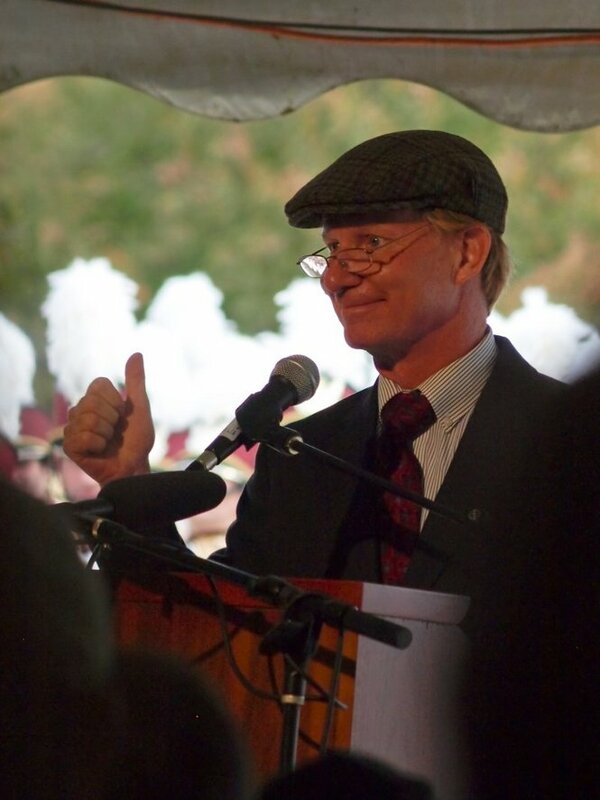 Called the “Pied Piper of the bandos,” he wore his love for UMass on his rolled-up, ever-conducting, ever-cheering sleeve. The real beauty of George’s happiness was that it was so contagious. 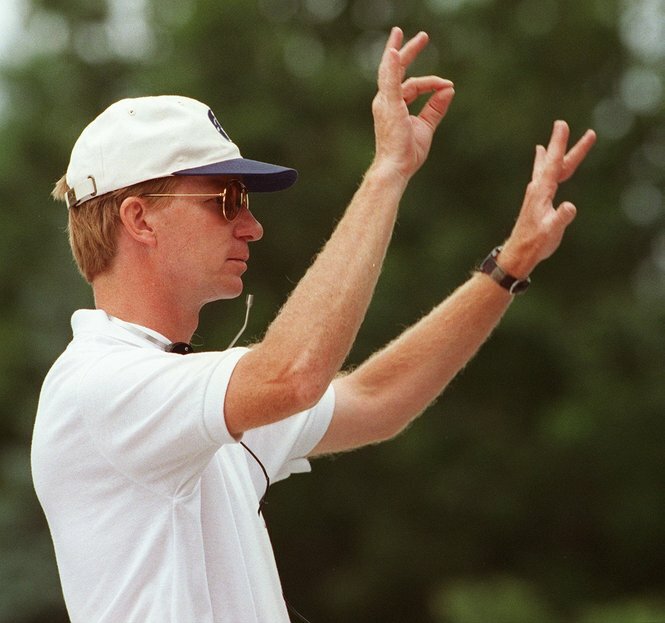 Thousands of people caught it from him – the audiences, alumni, and students, to be sure…but most of all, the 350 band members who were devoted to the man who inspired them to spend endless hours in drills, practices, road trips and performances – and to be the band they had only dreamed of becoming. 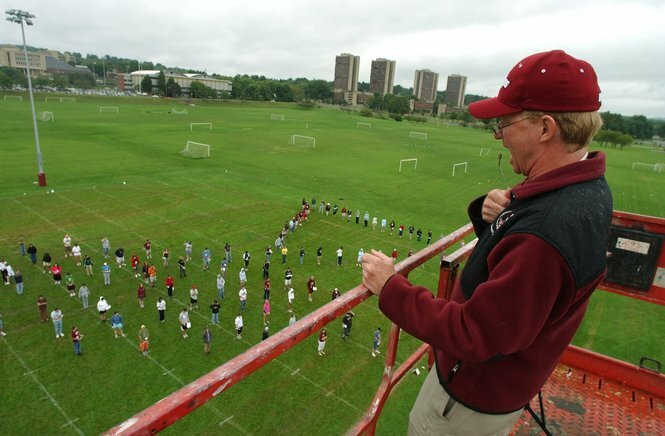 Under his leadership, the UMass Marching Band – known as the Power and Class of New England – won the nation’s top marching band honor in 1998 and was called one of the best bands in the country again in 2008. It was one of only 13 college bands to receive the Sudler Trophy from the John Phillip Sousa Foundation, and played during presidential inaugurations in 1981, 1985, and 2001. 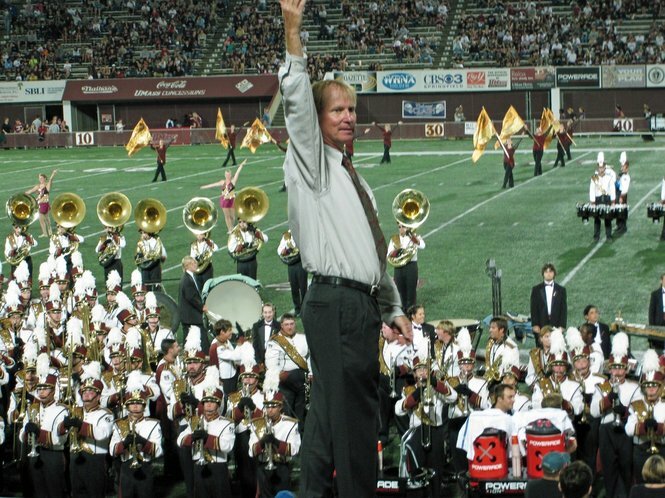 Parks led the honor band in the Tournament of Roses Parade in 2004 and 2008, and was enshrined in the Bands of America Hall of Fame in 2004. He taught camps, was an accomplished music educator and a gifted teacher –but in the end, he was just about the music. On September 16, George Parks, 57, died en route to Michigan with the band – on a long shot “pinnacle” performance he somehow made happen at the 110,000-seat Big House at University of Michigan in Ann Arbor – like he made everything happen for all his years at the helm. George and the band had stopped in Ohio to give a performance and to sleep, and George saw them through the show, led them in his favorite, “My Way” (whose lyrics include: “And now, the end is near, and so I face the final curtain…”).Then he stepped down from the stage and collapsed of a heart attack. George didn’t make it to Michigan Stadium with the UMass Band, but there’s little doubt in anybody’s mind that he’s in the real Big House now. He was just that kind of a guy. Band leaders aren’t the guys that get the glory. They give the glory – stepping out in high time to celebrate the team, to honor the school, to send a chill down your spine and rouse a cheer on your lips. It’s a generous, selfless role – and nobody played it better than George Parks. My hat is off to Parks today for his devotion to my alma mater, and his passion for the music. My $100 is going to support his favorite cause: a permanent home for the band that with his tireless advocacy he helped bring into being last November. By personally raising over $1.4 million in private contributions, mostly from band alumni, he carved out a place on campus for his band kids to practice, change, keep their instruments and perfect their music. And who could say no to a happy Music Man like George Parks? Certainly not me. To read more about George Parks or to donate to the George N. Parks Marching Band Building, click here. One of the things I love about your blog is the intimacy you create with a few well-crafted paragraphs and some perfectly-chosen photos. Ten minutes ago, I had no idea who George Parks was, and now he’s someone I wish I could have known personally. Thank you for this glimpse into the life of a wonderful man. Betty, this is such a tribute to Mr. Parks. I wish I had known him. Thank you for writing about him. One person can absolutely make a difference! What a touching, moving blog post today (not that they all are not touching, which they are.) 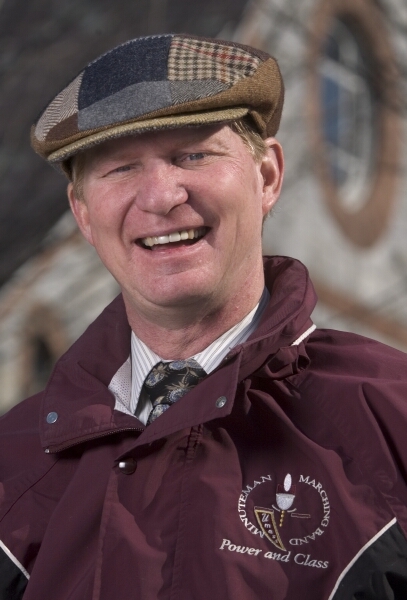 As sad as it must be for the UMass community to lose George, what better place and time for him to go then doing what he loved the most. Thanks for sharing this story and for the wonderful and deserving tribute you gave George!